So, you landed on this page to pick up the best Squarespace alternative that requires minimalist technical skills but offers great functionality. Squarespace is one of the simplest builders to use comprises the elegant templates for online stores, blogs, and fashion sites, etc. Gone are the days when building up a website scatter a mess apart buying a domain and hosting plan. You have to do a lot of work including dealing with coding parameters to craft a good appearance of your site. But with the time passage, things got simpler with the entry of website builders – entails almost no technical work and launch the site in just minutes of time. Squarespace stands among the best website builder software available in the market. Although Squarespace compiles with a bunch of features, but none is entitled to take as the perfect website builder. The only thing you can get is the best for you. So if Squarespace does not fulfill your requirements – especially for e-commerce website they have very limited payment gateways. Feel no worry as there are website builders similar to Squarespace that comes with some variety of features you may not find in Squarespace. So let’s look at our collection of top picks. Wix is one of the popular site builders with an increase of users that build websites on their platform. Starting with them is super easy, a setup wizard assists you to choose between ADI and Wix editor. The ADI editor best suits newbies because it is a much automatic way where they ask just a few simple questions to get a designed website. Wix editor is also very easy to navigate where you start by choosing from their 100s of free nice looking templates belongs to different categories such as online store, photography, traveling and blog, etc. The Wix editor allows you to make changes in almost every part of the web pages without messing with the coding. You can choose the layout of the webpage, create categories, and do the various editing from their toolbar. Furthermore, you can simply drag the elements to place them wherever you like. With Wix, you will get access to their app market which will provide hundreds of apps with easy installation and greatly improve the usability. You can seamlessly incorporate the social apps, marketing tools, chat options, eCommerce apps and much more. Wix is very much flexible and embedding codes is an excellent facility for guys love to do coding. The major problem with Wix is you’re bound to a template and at some point, if you feel to change it then you have to rebuild the site. While dealing with online services you always need support services from the company technical experts. Unfortunately, they do not have live chat feature but offer customer support on phone and emails. In addition, they provide access to their step by step video guides. You can start on Wix at no cost just for taste. As a free user, you got 500MB storage and 1GB bandwidth. And when you like them upgrade to your desired premium plan. They have a variety of plans starting from $4.50/month that allow you to connect the custom domain. To establish an online store they offer eCommerce plan at $8.25/month with more than $100 worth freebies. If you’re searching the Squarespace alternatives for launching an online store then Shopify is probably the best place. Their eCommerce focused builder makes complex jobs easier and also won several awards. They are powering over 500K online stores. For experience, you can take 14 days test drive here. They provide almost 100 free and paid templates for online stores. Unluckily, most of them are paid but the given free themes are also nice looking. The great point of selecting the Shopify is you don’t have to waste your time in managing the backend setting as it’s pretty straightforward even a beginner user can understand it within no time. On the dashboard of your Shopify, you are able to manage the different prospects of the store such as products, orders, and discounts, etc. They also provide insights like conversion rate, customer location, repeat customer, total orders and much more. Another thing that makes it a better choice than Squarespace is the availability of 1000s of apps which you can incorporate with few clicks. Just navigate to the app store from the dashboard and you will find apps regarding shipping, payment gateways, social, accounting and inventory management. They support 100+ payment gateways while Squarespace only limited to Stripe and PayPal. Similar to Squarespace, Shopify also charges the transaction fee (vary as per selected plan). Customer support channels such as live chat, phone, and emails are available 24/7 to free and premium users. Alternatively, they also maintained a tutorials section as well as a community forum. Another advantage of using Shopify over Squarespace is the pricing. There are 3 different plans that Shopify offers, the most basic plan cost $29/month and charges 2% transaction fee when using a third party payment gateway. Although it’s slightly higher than many other e-commerce tools available in the market which is why people search for its alternatives but its pricing worth their services except the transaction fee that might hurt a bit. 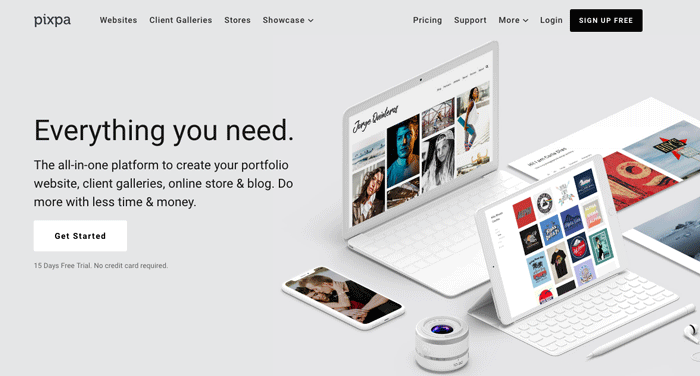 Pixpa is an all-in-one platform for creative professionals to create their website with an integrated e-commerce store, client galleries, blog and much more. Pixpa has become a hugely popular alternative to Squarespace, especially amongst photographers, artists, and designers who love its all-around capabilities and cost-effective pricing plans. Creating stunning websites is a breeze with a large selection of pixel-perfect, fully-customizable themes. All websites are mobile-friendly and work great on all devices. Its simple yet powerful, drag-and-drop website builder offers an easy solution for anyone without coding skills to create and manage their complete online presence in one place. Their support team is also available 24/7 on live chat and email to assist you whenever you need help. Pixpa outshines Squarespace quite a lot when it comes to showcasing, sharing, selling and delivering images. Galleries in Pixpa come with a ton of features such as support for multimedia content, 15+ gallery layouts to choose from, IPTC data import, powerful image gallery tools and much more. You can also create e-commerce enabled galleries to sell images as prints or downloads. The integrated Client Galleries platform lets users streamline their workflow and share, sell and deliver images to clients. You can also create a full-featured, integrated e-commerce store with Pixpa. One can start selling physical products, digital products or services within a matter of few minutes. Where many platforms charge a fee on each transaction, they have no fees at all on any transaction. So, all profit is yours. Best of all, Pixpa offers all of this at a fraction of the price of Squarespace with prices starting at just $6/month. It features, cost-effective pricing plans, and 24 x 7 support make it the preferred platform for creatives and small business around the world. Still, consfused to decide whether should you choose it? Don’t worry, there is a 15 days free trial is in place as well, go ahead and give it a try. Duda is another great Squarespace competitor with a reasonable pricing structure. Your website will operate smoothly with maximum uptime as Amazon cloud structure being used by Duda for hosting contents. Duda website builder is available to use since 2010 and a nice solution for those lacking the technical know-how and other site management skills. It has integrated backup, SEO, and analytics features. The site development time dramatically reduces by their drag and drop feature. You can add items to your website by simple mouse clicks. Unlike Squarespace Duda provides tons of widgets available such as a button, adding text, recent posts and search bar etc. 100+ fonts are supported by their tool. Just drag the desired element and drop it on the webpage wherever you like. Personally, we found it more comfortable to use than Squarespace. Duda allows you to make changes in the site design at any time. You can use the videos and images as a background and designed a beautiful webpage. Moreover, their content import feature enables you to import from the existing site without digging into technical work. You can even select a different layout for mobile, tablet, and desktop. Furthermore, website personalization is no more problem for novice users like adding pop-ups, notification bar, call us and off-hours rules, etc. Duda featured eCommerce store builder with their tool. Just navigate to store feature at the sidebar where you can manage sales, products, and promotions. Plus, shipping, taxes, invoice, payments methods and many other settings are configurable effortlessly. You can view and make changes for the specific platform like desktop, mobile, and tablet. Free users can access guides and community support while paid users also receive help 24/7 on live chat and 18 hours/day phone support. Before buying they provide the best opportunity by offering free account instead of a few days trial. In a free version, you can also use their ecommerce features up to some extent. The paid plans start from $7.13/month when subscribing for an annual basis and include a custom domain, HTTPS, backup, and developer mode. Compared to Squarespace, Duda does not charge any transaction fee instead they cap the number of products in each package. The multitude of features, well-designed templates, and great usability makes Weebly a great alternative to Squarespace. Working since 2007 and now empowering over 40 million entrepreneurs that are using Weebly. The beauty of this website builder that you can manage the site using Android, iPhone, and iPad devices too. After selecting the template, you land into their editor. Their site editor is very simple, and you will get accustomed soon even if you never tried a builder before. It works very smoothly all you just have to drag the element. You can change the color, fonts or even the entire theme without any hiccup. For developers, they integrate a very convenient CSS/HTML editing mode shows the different parts of the theme like header, styles, and assets, etc. allowing quick navigation. Every page of your website is easily customizable and got the integrated SEO tool for improving search engine visibility of the site. There are tons of elements in the builder helps in writing a blog post and building web pages. For example, you want to create a “Contact Us” page, all you have to do is create the page and drag “Contact Form” element from the sidebar. The app market contains hundreds of apps makes it the most powerful competitor to Squarespace than any other builder tool. Weebly is good enough to build an online store. The elegantly designed dashboard comes handy in adding products, gift cards, coupons, etc. You can execute and monitor the orders as well as abandoned carts. There are also many features necessary for operating eStore. They maintain probably all channels to assist their customers such as live chat, email, community place, and a wide range of guides and videos. Phone support is available to “Pro” and “Business” plan users. The major drawback of Weebly is it comes with limited templates editing options. For a test drive, you can start as a free user under their subdomain and 500MB storage. They divided the plans as “for websites” and “for online store”. So for a website, the plan ranges $8/mo to $25/mo when paid annually. The basic plan includes free domain name, $100 AdWords, and unlimited storage. For “online store” plan, Weebly is a bit costly solution as they charge a 3% transaction fee and limited products on the first two plans. The packages start from $8 to $38/mo. The third plan cost $25/mo (lower than Shopify basic) and allow unlimited products, SSL certificate and no transaction fee. So you may try Wix or go to Shopify alternatives here. WooCommerce is a WordPress plugin and considered as a strong alternative to Squarespace when it comes to controlling and pricing. WordPress is a top used CMS to create a website or blog. Both WooCommerce and WordPress are free to use blend together to and provide the best solution for establishing an online store. The only drawback that may some newbies face is the technical work involved such as buying a domain name, web hosting, installing CMS, SSL certificate and then managing them all. But such things also gives you more control. Fortunately, now the web hosting companies make such things much easier and you can get all ingredients at one place. Plus, some even offer pre-installed CMS as well as WooCommerce. WooCommerce is a leading software being used by almost 28% online stores. After installing the plugin, a wizard will guide you to set up all the necessary steps of the store. There is not a list of themes but you will get free stunning default “Storefront” theme. There are some child themes available too. Plus, you can use any third party theme if want to as WooCommerce is compatible with all. The free and paid extensions are the beauty of WooCommerce. More extensions are available to install than any other platform. You’ll find hundreds of extensions on the dashboard under the WooCommerce tab. There are lots of payment gateways such as stripe, PayPal, and Square, etc. WooCommerce is free and you gain full control over the plugin. And if you face any problem they have a wide knowledge base as well as video tutorials. For talking to their experts just submit a ticket and they will assist you at their best. It’s the genuine cost-efficient Squarespace alternative with more features. All you only have to pick a compatible WooCommerce web hosting for smooth operations. Loads up with tons of features BigCommerce provides a solution to launch the eCommerce web store. It’s a worthy alternative to Squarespace and a very similar to Shopify store builder. They allow easy integration to showcase your products on Amazon, Facebook, eBay and seamlessly with many POS software, etc. thus enables you to increase the conversion rate. They offer a number of advanced editing features in your hands. Moreover, there is also a massive list of responsive free and paid themes where each one got lots of editing options. Just navigate to the “Storefront” tab in the sidebar of the dashboard where you can edit the theme’s various prospects as well as the whole design. You can access all the features right from the backend to do the tasks like adding products, managing orders, and customers, etc. Moreover, setting up the checkout process, gift wrapping, exporting a third party theme, live chat and lots of others also included. On top of that, their app store allows you to utilize the diversity of features related to marketing, payments, accounting, monitoring tools and much more. Unlike the Squarespace, there is no transaction fee imposed by Bigcommerce on any plan. They help the customer via live chat, phone, and email. Plus, you can look at their guides. BigCommerce University carries tons of videos or asks a question in the community forum. The diversity of plans available ranging from $29.95 to $249.95/mo. Although the basic plan seems costly but this is quite lower than Squarespace. Moreover, there’re more payment gateways available and allow you to list your store on the bigger marketplaces. A dedicated SSL certificate also provided with all plans for secure transactions. All in all, BigCommerce is way much better than Squarespace for building an online store. Jimdo is not as far rich regarding templates variety as the Squarespace, but the ease of use, pricing and an abundant stock of widgets turns Jimdo into a close alternative to Squarespace. The best part, they let you operate from their mobile app available for Android and iOS users. It’s a perfect solution for freelancers and business sites. Jimdo offers two ways, Jimdo Dolphin and editor. The Dolphin creates the site in a breeze where they ask a number of questions, and in a few minutes your site gets ready to go live. The software built-in SEO tool can improve the visibility of the online store as well as subpages so that more customer can drive to your site. You can make changes in the templates styles, background or if you want to enhance developing skills, just play with HTML and CSS. Jimdo builder offer features to launch an entirely functional ecommerce store. You can add stripe and Paypal etc. for accepting payments. Plus, order management, Inventory and creating discounts are super easy. And most importantly they don’t charge any transaction fee. A big advantage of Jimdo over Squarespace is the availability of widgets that you can add to your site for more functionality. Tools regarding ecommerce, websites, communication tools and much more are away just a few clicks. For customer support, unfortunately, they do not offer phone support. In case of any issue, you can get expert help via emails or DIY guides. Currently, there are two premium plans to choose from. The first plan costs $7.50 per month for a yearly subscription. You get a free domain name, 5GB storage, 10GB bandwidth and approach to basic store features (15 products). Unlike most of the builders, Jimdo includes one email account with the basic plan. For bigger projects, subscribe their $20/month plan which comprises with unlimited storage & bandwidth, unlimited products, and priority support. Strikingly is on the go when seeking the Squarespace competitor. With its simplistic interface, it becomes effortless to build and manage the website. You can take a tour of their services as a free user where you select from almost 25 themes and then an editor comes in front of you. In our opinion, Strikingly is more suitable for creating one-page websites and stunning web pages. Compared to Squarespace, Strikingly hold an app store which is limited to a few apps. Some tools already integrated by them like SEO, Google analytics, collaborations and social media, etc. If you know a bit about coding, you can add custom codes. All you have to do is just open the “settings” and modify settings as your requirement. Being a simple tool, it will only permit you to change the fonts or entire template. You can also change the layouts and background of the site. Additionally, there is a number of animation effect for the page background, scrolling, and hover links. The very limited number of editing options and few integrations might become the bottleneck for you when trying to launch eCommerce store on strikingly. So missing diversity of features in Strikingly won’t make it the right choice for an online store. With that said, Strikingly is not the best website builder if you want to make a complex site. But it surely worthy and more convenient to use than Squarespace when in search of personal and business website builder with gorgeous pre-made designs. Many builders in the industry slip the chat support while with Strikingly you should feel free because of live chat, forum, email, video tutorials, and guides. Searching the website builder like Squarespace that contains comprehensive sets of features for an online store? Then here comes Volusion. With its drag and drop functionality, it’ll take no time to build a stunning store. They claim to help in raise the sales of almost $26 billion so far. Currently, Volusion offers 11 free and 38 paid impressive templates and you can take a drive of their builder with 14 days trial account. Their convenient dashboard never let you confuse and help you manage orders, customers, and inventory, etc. flawlessly. Moreover, they will also guide for the first time. Volusion makes marketing easier with its integrated tools. Just navigate to the “Marketing” tab that allows you to sell on Amazon, Facebook, and eBay, etc. Moreover, you can design the coupons and deal of the day to attract more customers. There is also SEO options as well as a sitemap generator for proper crawling and indexing. Another great thing is Volusion don’t charge any percentage of transactions. The payment gateways like Authorize.net, Skrill, and Stripe, etc. are available for free. There is no app market to extend the store features instead they incorporated almost every tool thus gives you more time to focus on the store. Customer care services are given via live chat, phone, and emails. Further, they maintained an extensive knowledgebase for self-help. To meet the needs of a variety of customers, they designed different packages. The plans start from $15 to $135/month with diverse specifications. The first “Mini” plan allows you to publish up to 100 products and 1GB bandwidth. You’ve to pay for SSL additionally. So while picking up any of Volusion services anticipate your future needs carefully. Webflow is another tool similar to Squarespace but offers more customizability. Before investing you can start with a free account. It will take nearly an hour to get familiar with their dashboard which is load up with features. The software designed in such a way to deliver the maximum customizability without touching the codes. To add the elements like text, images, videos, columns and much more you just have to drag it and drop on the desired place. Editing options are the best part of this software. Just click on any of the element and you will see tons of options at the right side. Moreover, you can set up trigger-based actions. The platform supports just a few integrations like Google maps, analytics, and social media. If you confused while taking the tour to backend settings, then you must look at the video tutorials posted in knowledgebase section. Additionally, email support, community forum, and numerous guides are provided by them. The major drawback with WebFlow that it lacks the eCommerce capabilities. The editor focuses on just building up informational websites/blogs. WebFlow’s free plan gives limited access to their features. The premium plans start from $12/month and allow 25K monthly visits. It also includes unlimited backups, SSL certificate, and CDN. As per our point of view, their pricing is higher than other competitors like Wix, Duda, and Weebly. But high flexibility, CMS features, and plentiful editing tools make it a potential choice for freelancers, designers, and businesses. So, Which is the Best Alternative to Squarespace? As we mentioned earlier in our article that there is none to be called as “Best” you must keep your needs at priorities and then pick from the above-mentioned Squarespace competitors. You’ll find the cheaper, easy to use and feature-rich services. In our experience, Shopify is the best choice for online stores and for creating simple websites Wix is an excellent selection. So, for the right tool which suits your needs and requirements, check features of all the services we mentioned before making any decision. Let us know your choice and experience with any Squarespace alternative through the comments section. Which is the best for a Start-Up podcast (and an associated blog)? Do they all have limits on number of RSS FEEDS?